December employment figures are out. Time to re-evaluate this assessment from a year ago in Political Calculations that California was in recession. The release provides an opportunity to revisit this question (the November employment figures are discussed here). It’s (still) unlikely that a recession occurred. Employers continued to expand payrolls at a solid clip in December. Payrolls increased by 24,500 net new jobs during the month, a 0.1% rise. While the state has enjoyed a string of 30 consecutive months of positive payroll additions, employment growth moderated somewhat over the past 12 months relative to 2017. The number of new jobs added in December is consistent with the 23,700 average monthly additions registered throughout the year, but is slightly lower than the 30,500 new jobs averaged last year. While job growth appears to have been more moderate in 2018, monthly estimates have been somewhat volatile, notably in the first half of the year. The end of the year ended on a much stronger note, and over the past 12 months payrolls have risen at a solid 1.7% pace, which amounts to 284,300 new jobs. Employment growth has been broad-based, with a majority of industries expanding payrolls. The only major industries to register declines in December were construction (-1,300) and retail trade (-1,200). Some of the weakness in these areas may be reflecting impacts of the devastating wildfires that spread through parts of Northern and Southern California. Here are two pictures in levels to buttress the case. Figure 1: Nonfarm payroll employment in US (black), in California (dark blue), in logs 2011M01=0. Source: BLS, and author’s calculations. The establishment series gave no evidence of recession. What about the household? 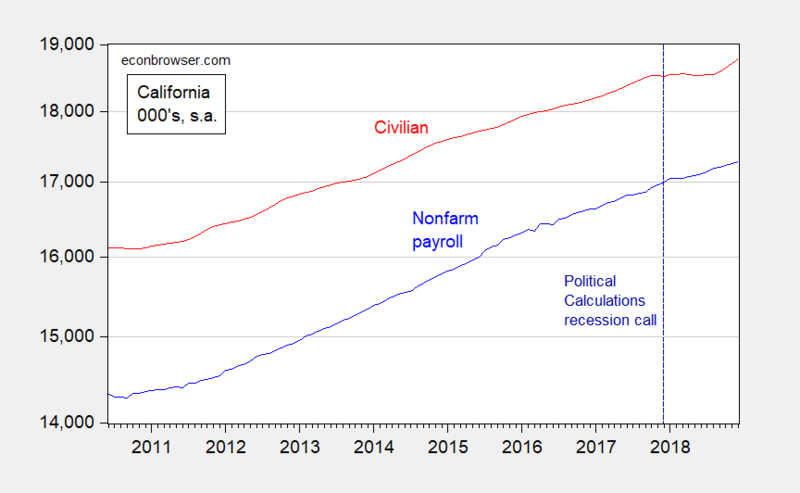 Figure 2: Nonfarm payroll employment (blue) and civilian employment (red), in 000’s s.a., both on log scale. 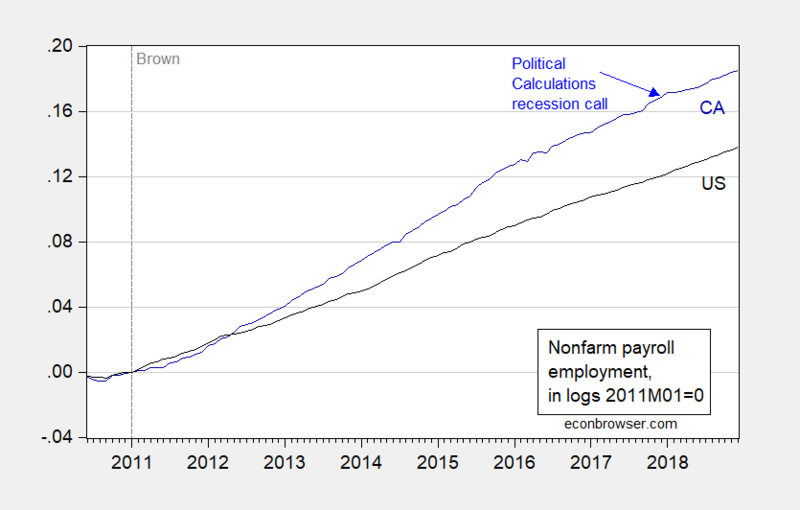 Dark blue dashed line at Political Calculations recession call. Source: BLS. While ultimately, civilian employment did decline slightly over 5000 in December (according to the latest available vintage), this dwarfs in comparison to the standard deviation of changes of 16,000 … (2010M06-2018M12). I’m sure Ironman will defend himself by saying the vintage he used indicated a decline. But, as I have said before, beware the state level household survey, even in a state as large as California, exactly because of the large benchmark revisions. This entry was posted on January 18, 2019 by Menzie Chinn. Menzie, it’s very funny I was going to ask you if anyone at Political Calculations has emailed you personally to address your assertions?? When I visited there I found some semi-entertaining posts (maybe not in the way Political Calculations want it to be entertaining). There is some mentioning of a certain “feline creature” in a post dated 2015. Were you aware of this?? It seems slightly rude on their part. You know whose side I take on this (I don’t need to say do I??) That post is exceedingly long, and I’m wondering, based on the length of their post (and the fact intelligent people such as yourself can hide their IP addy if they WANT to hide their IP), wouldn’t that make them (Political Calculations) the “stalker”?? I know you’re more than capable of handling yourself and the situation, but putting some of the things he put up crossed the line I think. I mean I know those things can be gotten pretty easy, I’ve known that really decades ago, I had a program where you could see people’s IP by using the DOS interface or what do they call it, the DOS “command line”?? When I was younger I used to get on Yahoo “chat” (no longer exists) and internet chat with strangers. This was BEFORE proxies and VPNs became very common. And I thought it was cool to know where people were chatting from–it was a quick way to tell if someone was lying just by asking them where they lived and then looking at the IP. More sophisticated things now obviously. It’s very oddball behavior, and that’s coming from someone who gives a very long leash to eccentrics. It’s strange he talks about “projection” as the more he goes on and stretches out that page, which has no real logical point AT ALL (anyone would know you have to visit the site to check the validity and fact check his posts) the more he proves how sensitive he is himself to criticism. He must have known on some level (if not consciously) you were right, or why change his language related to the “recession”?? It appears after all that diagnostics he did on his blog, your biggest “sin” is reading Zero Hedge. I read Zero Hedge. So do many hedge fund and bond fund guys. Where the hell else can you get LARGE portions/sections of investment bank research letters almost verbatim for FREE?? I don’t have to click on their trump/Reagan/Friedman/Hayek worship, I don’t 98/100ths of the time, neither I doubt do you. The human mind is a strange thing.